Route: Chengdu – Lhasa Tibet – Everest base camp then overland to Kathmandu Nepal. Arrival in Chengdu- arrival transfer - check in to the hotel. After Breakfast visit the Giant Panda Breeding Research Station and Wenshu Temple, participate in a charming tea ceremony. When you arrive in Lhasa, your Tibetan guide will greet you and take you to your hotel. You may view the Yarlung Tsangpo River/ Bhamaputra river (the Longest and largest river in Tibet) and Lhasa river on their way to Lhasa. After arriving in Lhasa, you can take a rest and get acclimatized to high altitude. 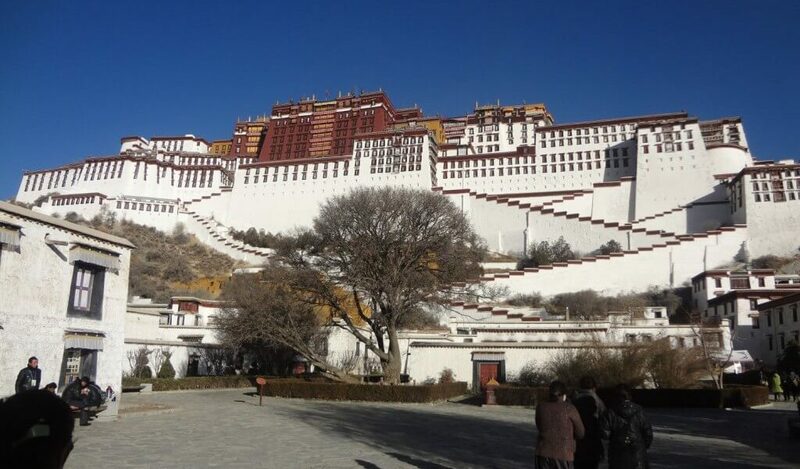 If you feel to go out, then you can go to the Potala Square, where you will enjoy the fountain with different colors and get amazing photos of the Potala and around. Stay overnight in Lhasa. Hotel Kyichu or Similar. In the morning, we will visit the home of Panchan Lama - Tashilunpo Monastery. Then, we’ll leave Shigatse after getting your Alien’s travel permit, and then drive to Lhatse, it is a small town where you can have lunch. After that, we will pass Tsola Pass(4600M), and Gyatsola Pass(5248M). Shortly after we enter Mt. Everest National Nature Reserve, tourists can enjoy the panorama of Himalaya at Gawula Pass(5198m).Then we drive along the New zigzag road to Everest Base Camp(5200m). You can get closer to gazt at the Mt. Everest peak. The sunset of golden Everest peak if time and weather permits at the lodging area. Stay overnight at Rongbuk monastery guest house. Depart from Nepal - Last day of the trip.